Scott Wiener, as supervisor, did several outstanding things that greatly benefited our neighborhood and our city. As Senator his actions are coming from another place altogether. Opposition to SB 827 has grown dramatically since it was introduced in January. Opponents now include the City of Los Angeles, former SF Mayor Art Agnos, the Sierra Club, the San Francisco Board of Supervisors (who voted to oppose it last week by 8 - 3). In addition, three out of the four of the main mayoral candidates - Mark Leno, Jane Kim and Angela Alioto - oppose the bill. Only London Breed views it favorably. We the undersigned residents and organizations represent communities across the city, rich and poor, tenant and homeowner, newcomers and oldtimers. We stand together with others across the state to urge defeat of SB 827 (Wiener) in any form. This bill unilaterally takes away the opportunity of residents in every part of this city to participate in basic decisions about the livability and sustainability of our communities. It is fundamentally and irreparably flawed. SB 827 forces a top-down, one-size fits all strategy that will destabilize the character of many of our neighborhoods almost overnight, revoking power from our district supervisors and planning departments, and silencing the public input on new development -- input that can and has resulted in more affordability, more jobs, and stronger communities. In the name of 'transit-friendly housing', SB 827 undermines the ability of the most transit-friendly city in the state to plan and support our publicly-financed transit system. We have one of the morst intensive public transit system in the country, not because politicians in Sacramento mandated it, but because our residents voted to support and pay for it. In the name of affordability, it rewards real estate speculators with enormous windfalls and weakens our city's ability to incentivize and create more affordable housing. While it includes limited protections for tenants who are directly displaced by new market rate projects, it completely fails to address indirect displacement caused by rising real estate prices and higher rents. Furthermore, SB 827 incentivizes the destruction of existing commercial buildings, and will contribute to the displacement of current neighborhood-serving businesses that are the cultural and economic core of our diverse neighborhoods, adding to the widespread cultural displacement many of our communities are already experiencing. In addition to the direct and physical harm it would cause to our neighborhoods, SB 827 would more generally undermine our democratic processes and ability to protect the environment. By overriding local planning and environmental requirements, SB 827 would also override our city's efforts to be sustainable. If the bill is adopted, new growth would be imposed by developers at almost any city location of their choosing, increasing demands on existing water and sewer systems, roads, utilities, schools, parks, and other public services and infrastructure. Such developments would be approved with minimal public review, without full disclosure or analysis of impacts, and without consideration of more sustainable and environmentally sound alternatives. Following are 2 links to the text of the bill. The first is the original bill submitted in January; the second is a later version after numerous amendments. SB 828 is the special interest's quiet revolution to make all home construction in San Francisco and California "by-right" *. All California cities have quotas for new home construction called Regional Housing Needs Allocation or RHNA for short. San Francisco currently meets and exceeds its RHNA quota for market-rate BUT NOT for below-market-rate housing. In fact almost no city in California meets its quota for building below-market-rate housing. But what's the consequence for not meeting RHNA goals? Up until January, 2018, there was no price to pay and pretty much no consequences for not meeting RHNA goals BUT Senator Wiener's new law that took effect just this past January (SB 35) forces any city that doesn't meet its RHNA goals to let ALL construction become by-right. If San Francisco doesn't meet its RHNA goals, ALL construction will become by-right in this City. * What is by-right construction? In this regard, SB828 is a Trojan Horse for by-right development. Why? 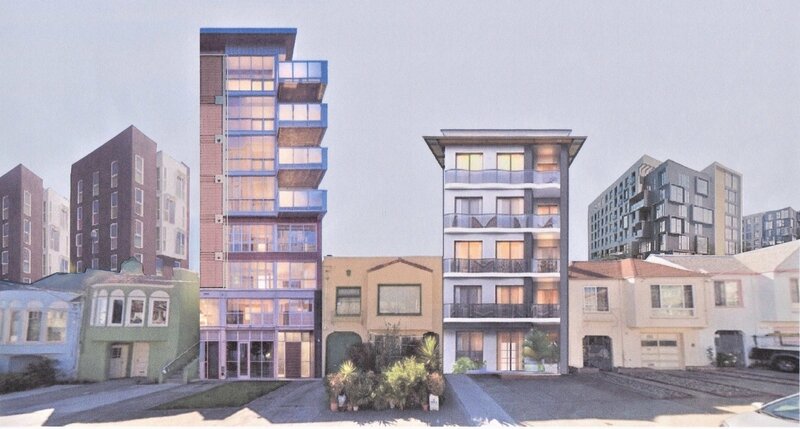 Because this legislation increases San Francisco's RHNA goals to new levels and forces Senator Wiener's new law that ushers by-right development to kick in. This will result in carte blanche for speculators to build anything anywhere in the City while eliminating neighborhood's ability to weigh in. In effect, this bill would silence the voice of neighborhoods.